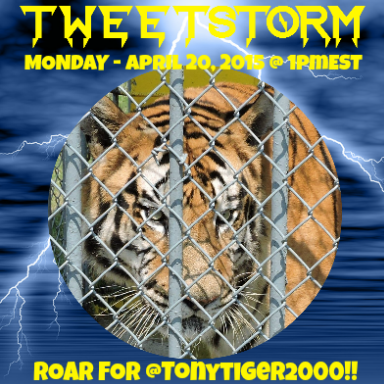 We will always be thankful for Animal Legal Defense Fund‘s dedication to Tony and for their relentless efforts in trying to secure his release to a reputable big cat sanctuary. 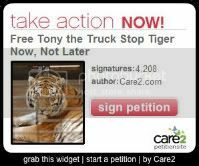 Thank you ALDF for continuing to honor Tony by fighting on in his memory to ensure no other tigers are subjected to being a roadside attraction at Tiger Truck Stop. You will always have the support of Tony’s friends. Like many of you, we are still mourning Tony’s passing last October. 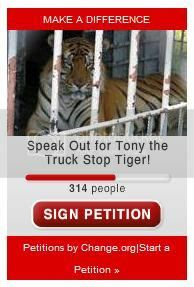 Tony was a Siberian-Bengal tiger held captive in the Tiger Truck Stop parking lot in Grosse Tete, Louisiana for years. Despite his tragic death, the Animal Legal Defense Fund continues to fight on in his memory. Today we filed an appeal of a decision that mistakenly found that Tony could not be considered an “individual” under the Freedom of Information Act. We are challenging the decision in the United States Court of Appeals for the Ninth Circuit to ensure that animals like Tony will be protected by the Freedom of Information Act and people have speedy access to crucial information when an animal’s safety is in jeopardy. BATON ROUGE, La. 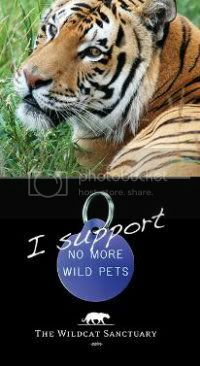 – The Animal Legal Defense Fund filed a lawsuit against the United States Department of Agriculture for refusing to recognize a captive tiger as an “individual” whose physical safety is at risk and refusing to expedite the organization’s public records request. The Animal Legal Defense Fund is seeking records under the Freedom of Information Act (FOIA) related to the health and well-being of Tony the Tiger, who has been confined at the Tiger Truck Stop in Grosse Tete for 16 years. The Animal Legal Defense Fund sought expedited processing, which FOIA requires when delayed disclosure “could reasonably be expected to pose an imminent threat to the life or physical safety of an individual,” namely Tony the Tiger. The USDA erroneously denied the Animal Legal Defense Fund’s request, asserting that Tony is not an “individual” because the term applies only to humans. The Animal Legal Defense Fund does not agree. Upon denial of the expedited request, the Animal Legal Defense Fund filed an administrative appeal challenging the USDA’s decision—which was constructively denied based on the USDA’s failure to resolve the appeal within the statutorily required time period.